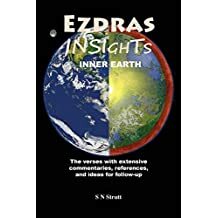 My third book 'EZDRAS INSIGHTS' is now available at AMAZON. both as a paperback and on KINDLE. EZDRAS INSIGHTS contains the Apocryphal Book of ‘II EZDRAS’ which was in the KING JAMES version of the Bible until 1885. Why was it taken out? Read on and find out WHY? EZDRAS INSIGHTS has many Bible verses as cross-references, as well as ‘insightful comments’. II EZDRAS talks about the ‘Bride of Christ’ & also the ‘Call of the Bride’. 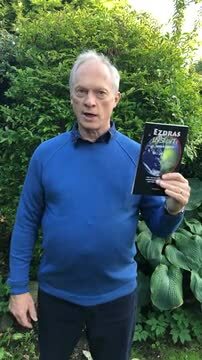 As in Enoch Insights, my second book Ezdras Insights mentions that the earth is actually hollow in five different chapters. It also mentions the coming Messiah and prophesies very accurately that he would come in 400 years from the time of Ezra, who wrote II EZDRAS. This turned out to be exactly correct. This book also talks about Salvation & Zion. It amazingly predicted the rise of the Roman Empire over 400 years before it happened. It talks about the Son of God & the coming Wrath of God, as well as Babylon the Great, as also mentioned in Revelations 17-18. The 20 appendices are chock-full of extra information about Hell, Portals, man becoming smaller, weaker, not taller and stronger as modern science teaches, and many other interesting topics. This book even proves that the earth is very young, and not much more than 6000 years old. Amazingly this book also explains what happened to the missing 10 tribes of Israel back in around 700-800 BCE. That alone is an amazing and incredible story. "Not only can you read whole chapters of II Ezdras, but with each verse, the author has made comments to explain the meaning, plus adding many Bible verses confirming it." -- Simon D.
The Book of II EZDRAS, is in my opinion, one of the most interesting of the Apocryphal books, that I have had the privilege of studying. Why? Because this book is, in few words, both miraculous, supernatural & inspiring! Contrary to what others have stated, I believe that this book is an accurate account given by God to Ezra, through His angel Uriel. It is stated to Ezra by God Himself, that he alone would see the visions that he saw. The Book of II Ezdras, was originally written about 2500 years ago, or between the 5th and 6th centuries BCE. I propose, that unfortunately in our modern times, many Christians are conditioned by “the traditions of the churches”, only to believe the easy to believe topics, and most people do not embrace the truly miraculous, which used to be much more accepted in the “less enlightened days” of man’s wisdom. I am reminded of the cryptic bible verse: 1CO.2:14 ‘But the natural man receives not the things of the Spirit of God: for they are foolishness unto him: neither can he know them, because they are spiritually discerned’. I have heard writers dismiss the ‘Book of II Ezdras’, saying that it sounds too much like the New Testament, and wasn’t written by Ezra, but by the Christians in around 90 AD, impersonating Ezra. However, after close scrutiny of the book, one is quickly shown, that that is clearly not the case, and that the Ezra mentioned in the bible, who lived from circa 550 to 450 BCE, is indeed the same person who wrote II Ezdras. This is very often the modern way, i.e. scepticism, unbelief and taking things apart, instead of having simple faith.” Another bible verse comes to mind: “I fear lest by any means, even as Eve was corrupted by the Serpent, through his subtlety, so your minds should be corrupted from the simplicity that is in Christ” (Colossians 2.8) Those who write sceptically about the book of II Ezdras, obviously have not taken the time, to really study what Ezra was saying. It also takes faith in God to understand it. As mentioned before, it becomes apparent in reading the Book of II Ezdras and other Apocryphal books, that most of the information given is most definitely inspired by God. 2PE.1:20 Knowing this first, that no prophecy of the scripture is of any private interpretation. 2PE.1:21 For the prophecy came not in old time by the will of man: but holy men of God spoke as they were moved by the Holy Ghost. The Apocrypha is a selection of books which were published in the original 1611 King James Bible. These apocryphal books were positioned between the Old and New Testament (it also contained maps and genealogies). The Apocrypha was a part of the KJV for 274 years until being removed in 1885 A.D. A portion of these books were called deuterocanonical books by some, such as the Catholic church. Others believe it is valid scripture, and that it should never have been removed- that it was considered part of the Bible for nearly 2,000 years before it was recently removed a little more than 100 years ago. Some say it was removed because of not finding the books in the original Hebrew manuscripts. I am also convinced that certain books were black-listed in the past, because of the content. In the case of the book of II Ezdras, it was because it clearly prophesied about JESUS centuries in advance of His ‘1ST Coming’ and also foretold his death. Both the Book of II Ezdras & the Book of Enoch, one around 2500 years ago and the other around 5000 years ago, were given in visions and dreams, and brought to firstly Enoch and then Ezra by the same Arch-Angel or otherwise known as, one of the angels of the Presence of God, called Uriel, or as sometimes called in Jewish writings, Ariel. Studying the Books of both Ezra and Nehemiah in the Bible completely confirm this book of ‘II EZDRAS’ authenticity and its time period of having been written around the 5th to the 6th centuries BCE. Concerning other non-canonical books: The fact is that the early Christians all referred to the “Book of Enoch” and the ‘Septuagint’ version of the Old Testament. The Septuagint version of the Old Testament is more revealing and has more details of events than the King James version of the Bible. Who would not want books such as both the ‘Book of II Ezdras’, & the ‘Book of Enoch’ available to the public? I would venture to guess those who are not in favour of Christianity. These ancient texts prophesied directly about Jesus, proving that He was in fact the Saviour hundreds, and even thousands of years before he was actually born on earth. There are 16 chapters in the Book of ‘II Ezdras’. This book can still be found in the Eastern Orthodox Bible. The content of this intriguing book, is jam-packed with very interesting visions about Zion, & The Bride, The Coming Messiah, descriptions of the Wrath of God & a 3 Headed Eagle.The missing 10 Tribes of Israel.Where did they go? There is even an amazing prophecy in II Ezdras, about the birth and death of Jesus the Messiah, 400 years before it even happened! Although even this key information, somebody has deliberately been trying to hide, as you will see when you read this book ‘EZDRAS INSIGHTS’. God reveals a lot of information in this book, and that is most probably the reason why this book has been largely ‘hidden away’ from the sight of most people. Why? Because it reveals too many facts that certain powerful people, do not want the masses to know about or believe in. Another unusual topic is that Chapter 4, as well as some other chapters, strongly allude to the earth being hollow!